Beth at Plum & June challenged readers to talk about their photos of fabric this week. I primarily take my photos with my iPhone and edit them before posting. If not, I use a Sony cyber shot ?? And edit in Lightroom. That is the standard program on my old desktop that my daughter used. I have gotten much better at the Lightroom but usually opt for the quick photo. Here are a couple I took today on my current project. BTW I just got this cool new ap to post my blog from my IPAD. I used to just use blogger but had issues loading photos so I would switch back and forth to the blogger ap. This new ap is called Blog Touch and it works great so far....these are both edited. Things I could have done better? Taken them outside for some natural sunlight or opened the blinds. I have the house closed up because it so hot right now. I should have cropped the bottom one more. I definitely could take a lot more photos and find the best to post. I'm too impatient. One persons who's fabric photos I always admire is Red Pepper Quilts. The fabric is always in the same format and always looks so crisp in the picture. I will aim for that next week. that's some beautiful quilting in the borders! looks like hand, right? you're right about the natural light helping - it does wonders. but the heat . . . =) like good quilting, photography takes patience most of the time. Thanks, Hydeeann. It is machine FMQ, it was the first time I tried this pattern and my stitches are a bit long, but I'm happy with it. The pattern is Leah Day's paisley, I love looking at her patterns for inspiration. I am always in a hurry to get pics in my posts and get the thing published. You are sew right about the natural light. It sure makes a big difference. Your FMQ is looking good! I use Lightroom as my main photo processing program but have never tried Blog Touch. Thanks for the tip. 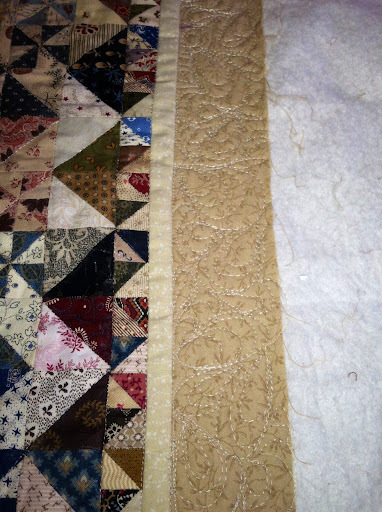 Your quilting shows up beautifully and looks great! Beautiful quilting! I have wondered about posting from my iPad. Thanks for the idea! I will have to try it.